It came to my attention last week that homemade popsicles are all the rage this year and I had not yet hopped on the bandwagon. 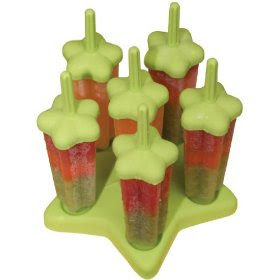 But after reading about them here and here and here I decided enough was enough and we were no longer going to endure these triple digit days of Summer without some popsicles for comfort! And true to form, I also wanted these super cute Tovolo molds everyone was using, even though I have some multi colored ones I picked up at a garage sale a few months ago (never used!). But these were so much cuter! Deciding though to use my better judgement and save my $13 + shipping for a rainy day, I settled on using what I had. That is until we came across them at Nordstrom Rack this weekend. And for only $9.96! To my suprise, Chris was the one who insisted I buy them. I'm pretty sure he's been hankering popsicles since I mentioned them last week. So we purchased some. And I couldn't be happier with the results! That night I made strawberry, nectarine and blackberry pops (aka: the fruit the was about to go bad in the fridge) and oh my, they are so refreshing and so easy! The splendid thing is, they are a healthy alternative to store bought and the possibilities are nearly endless! Next I would like to try some kind of watermelon mint combo! YUM! !